Here’s a fantastic recipe that is quick and easy. I got very tired of just putting tomato sauce on my pasta and found this recipe at the LCBO. It’s light and healthy and surprisingly tasty! Give it a try next time you are going to make pasta. Bring a large pot of water to a boil. Meanwhile separate and peel the garlic cloves. Slice them thinly, then set aside. Seed, and then dice both of the peppers. In a large skillet, heat the oil; add the peppers and cook, stirring until the peppers have softened, about 5 minutes. Reduce the heat to medium-low and add the garlic. Cook the garlic, stirring for about 10 minutes or until the garlic caramelizes. 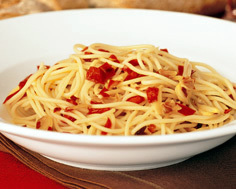 Add a generous amount of salt to the boiling water, then cook the spaghettini until al dente. Drain and toss with pepper and garlic mixture, season and add a little more olive oil if necessary.